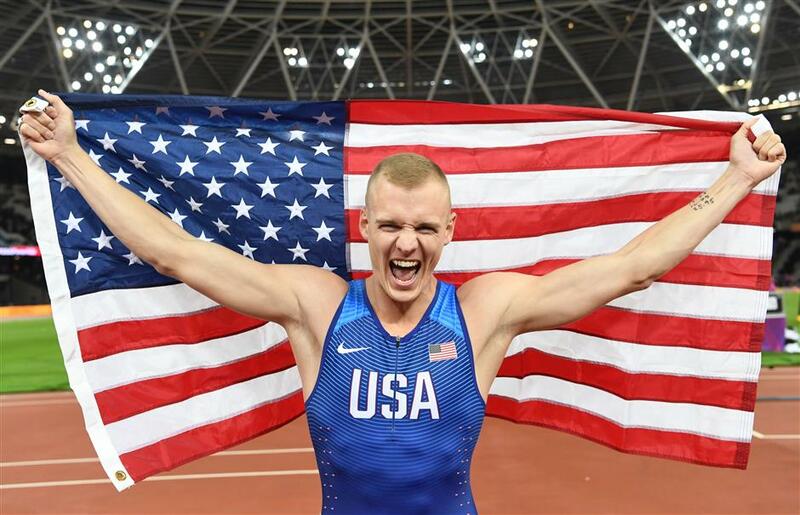 American army reservist Sam Kendricks caps his memorable, unbeaten season by winning the pole vault at the world championships in London. Sam Kendricks will soon step on the podium as a gold medalist and hear the only song he knows by heart — "The Star-Spangled Banner." "The anthem is something near and dear," said the Army reservist and pole vault world champion. "I don't know how I'm going to react." Things are definitely looking up for him these days. In March, Kendricks was promoted to first lieutenant. On Tuesday, he went from bronze at the Olympics to gold at the world championships. Kendricks edged Piotr Lisek of Poland and 2012 London Games champion Renaud Lavillenie of France by being remarkably consistent. Kendricks doesn't use as long of a pole, which means he must use military precision to eke the most out of his game. "I was the best jumper I can be on a shorter pole than everyone else. Tonight, it handed me my victory," said Kendricks, who cleared 5.95 meters to earn the win. Asked why he uses such a shorter pole, he shrugged: "Takes me less time to get to the bar — less time to make errors." A funny thing happened on his victory lap — he went too fast and got a stitch in his side. He had nothing left to prove. But clearly, he prides himself in giving maximum effort at any time he's out there. This, after all, is fun and games. Kendricks' stay in London will reach its high point on Wednesday, when he receives the gold medal and the Stars and Stripes are raised in the stadium. A stark contrast from home, where his unit has been loading ships in South Carolina. He was given time off so he could compete. "I'm glad I have a medal to show them," said Kendricks, who trains in Mississippi and is coached by his father. "Being an officer is being on call when one of your soldiers needs you, and staying up to date with my personal fitness, and to be ready when my unit calls me." After his lap was complete, Kendricks carefully folded up the American flag and draped it over his shoulder, covering up the smaller flag on his jacket. "Sometimes, the bigger flag is nicer," he laughed. Kendricks gave his flag from the Rio de Janeiro Olympics to his twin brother. This one is going to his girlfriend. It was meticulously earned, too. Kendricks used a marker to jot down on his arm the takeoff points he wanted to hit during his run-up to the pit. It worked, and he joins Brad Walker (Osaka, 2007) as the only American men to win a world pole vault title. "We often considered ourselves the masters of the 1 percent," Kendricks said. "How can an athlete like me, who's not necessarily at the top of the world in anything, numbers-wise, how can I be at the top of the world in the pole vault? "I can get a little bit better in everything, be a little more exact than I was the day before." He had to sweat it out, though, as Lavillenie raised the bar to 6.01 meters to go for the win. "You have one champion and two other medalists," said Lavillenie, who's been dealing with injuries, "so that's why I wanted to keep putting pressure on Sam to try 6.01." After the competition, Kendricks shared a moment with Lavillenie. "I know no one is more dangerous than Renaud at this time in history," Kendricks explained. "I said, 'Good job, brother. We'll have a good one next time. Now, let's go get dinner'." Sam Kendricks celebrates with the US flag after winning the men's pole vault final at the world championships in London on August 8, 2017.